If a toe nail and in particular the matrix (‘root’) is damaged significantly it will result in the nail becoming irreversibly thickened. The damage can arise from a single major trauma such as a crush injury, or from multiple minor traumas over a long period of time such as constant rubbing against the inside of the toe box of a shoe. Nails that have become thickened due to trauma often present with secondary fungal infection as a fungus will find it easier to become established in the aftermath of a traumatised nail than in healthy nails. A thickened nail may therefore be even thicker and more discoloured than it would otherwise be without the fungal infection. Thickened toe nails are often loose with only part of the nail being attached to the nail bed. The presence of ulcers & bacterial infections under the nail plate is not uncommon. Additionally, blood blisters under the nail plate are very common where the thickened nail has rubbed in footwear, this accounts for many thickened toe nails having dark areas beneath. Toes that are hyper-extended (stick upwards) are more likely to become damaged & thickened. The 1st & 5th toe nails are more commonly affected, and on rare occasions nails can be thickened from birth. Poor peripheral circulation can also contribute to the development of thickened toe nails. 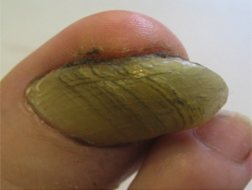 A thickened toe nail should not be the cause of concern although some patients will find the aesthesis unacceptable. Thickened toe nails would usually be treated conservatively by our Podiatrists. This involves reducing the thickness of the nail with a burr (a coarse grinding stone that spins at high speed ). This is a painless and routine treatment undertaken daily in our Practice, and even the most unsightly nail will look acceptable after it has been treated (see pictures below). This conservative treatment would be required every three months or so to keep the nail(s) looking presentable. However some patients prefer us to remove the thickened nail(s) permanently thus eliminating the need for ‘cut-n-come again’ treatment. This involves a minor surgical procedure called a TOTAL NAIL AVULSION.